Optional components: 1N4007 diode for reverse polarity protection and PolySwitch re-settable fuse (PPTC for short, ideally rated at 100mA) or similar for short-circuit protection. 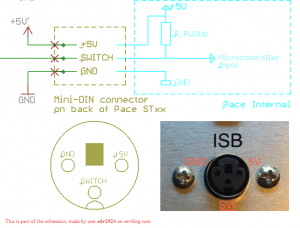 I will not go into the details on how to build this very basic circuit. I’ll rather describe its working principle and accompany it with a schematic. The circuit is essentially made from two parts – the emitter and receiver. The emitter is just an ordinary white LED diode connected to the +5V line. On the other end there is a receiver – a simple photoresistor in a voltage-divider circuit together with the variable resistor, controlling or driving the NPN transistor. 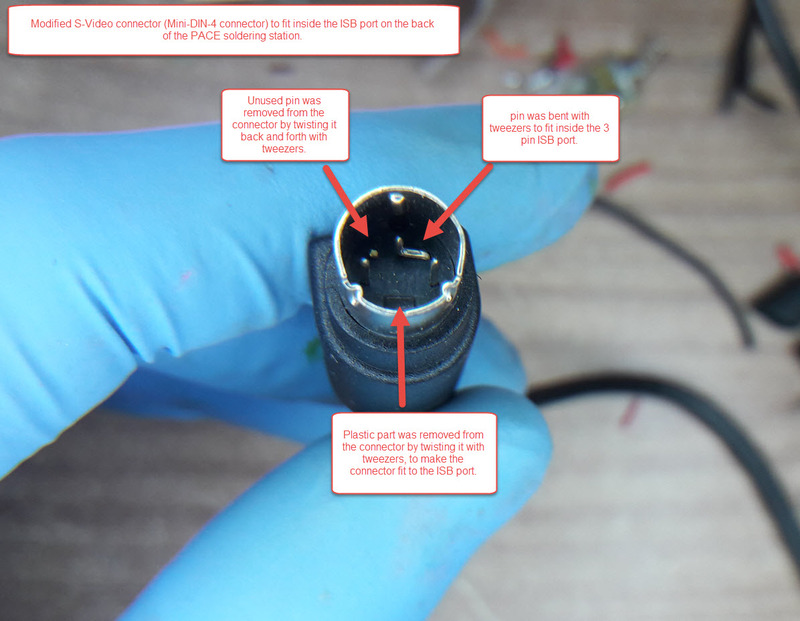 If you have one of these units: ST 30, ST 50, ST 65, ST 70, ST 75, ST 115, WJS 100, MBT 301 or MBT 350, there is a mini-DIN-3 connector port on the back of the soldering station. +5V line will be used to supply power to your DIY ISB circuit. 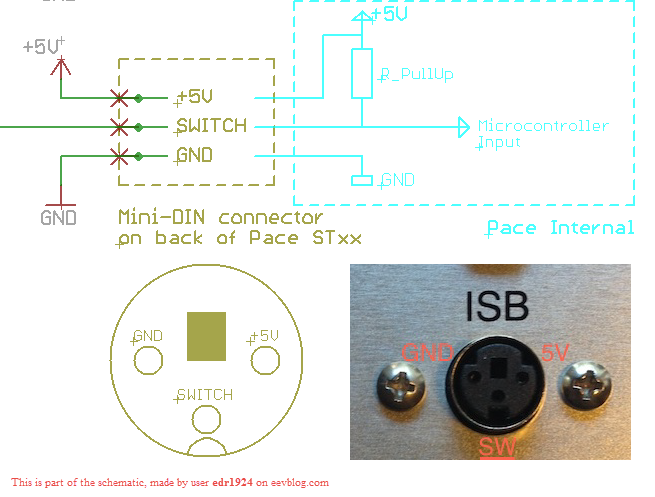 The SWITCH line is used for communication with the micro-controller inside the PACE station, about the presence of the soldering iron in the ISB Cubby. When there is no soldering iron present or the ISB Cubby is not connected to the station, the line is pulled HIGH (to +5V), via the pull-up resistor inside the station. If you measure the voltage on the mentioned line, it should read a bit below +5V. 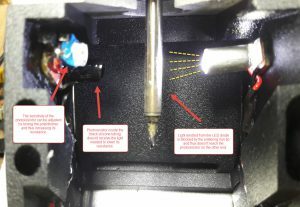 When the soldering iron is placed into the ISB cubby, SWITCH line is pulled LOW (to GND) by the ISB Cubby’s circuitry and the micro-controller initiates the 45 second countdown, before lowering the temperature of the soldering iron to 176°C/350°F. This behaviour can be simulated by shorting the GND and SWITCH lines on the ISB port with a piece of wire. Modified S-video (mini-DIN-4) connector to fit inside the ISB port on the back of the PACE soldering station. The LED diode can be wrapped in an ALU tape / ALU foil or similar light reflective material to amplify and concentrate its light output to the photoresistor on the receiving end of the circuit. The current limiting resistor must be used in series with the LED diode. Its value can be calculated based on the properties of the LED used. An online calculator can be used. Photoresistor and potentiometer are used in a simple voltage-divider circuit, regulating the voltage on the base of the NPN transistor. When photoresistor is receiving the light emitted from the LED (no soldering iron is in the ISB cubby, blocking the light), its resistance is low, thus pulling the voltage on the base of the NPN transistor LOW. 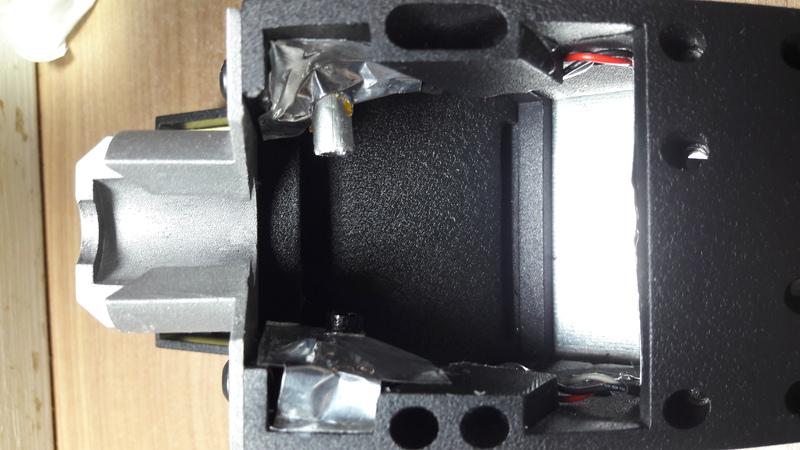 In this case the connection between the collector and emitter pins of the NPN transistor is open, the SWITCH line stays HIGH; microcontroller inside the soldering station “knows” there is no soldering iron present in the ISB cubby. When the soldering iron is placed into the ISB cubby, the light from the LED diode to the photoresistor is blocked. In this case the resistance of the photoresistor is high and so is the voltage on the base of the NPN transistor. NPN starts conducting (connection between the collector and emitter pins is established), the SWITCH line is pulled LOW (to GND). Microcontroller is now “aware” the soldering iron is being placed in the ISB cubby. It initiates a 45 second countdown, before lowering the temperature of the soldering iron to 176°C/350°F. 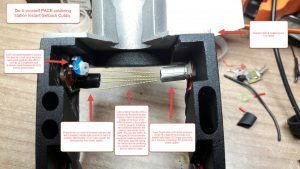 When the soldering iron is removed from the ISB cubby, its temperature instantly starts to increase to the user set value and is ready to be used within seconds. The sensitivity of the circuit can be adjusted by slowly turning the potentiometer and thus increasing or decreasing its resistance. To increase the reliability of the circuit, photoresistor needs to be protected from an uncontrolled outside light by a black silicone tubing. WARNING: If there is no resistor (a few K ohm) in series with the potentiometer on the +5V line, and the potentiometer is adjusted to low resistance, at the same time the photoresistor is low resistance (it is under direct light), the +5V and GND lines would be shorted. 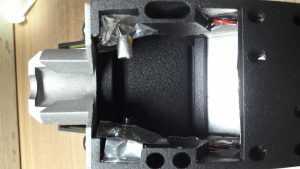 This would result in a damaged potentiometer. Soldering iron is present in the ISB cubby, temperature setback mode is activated. I hope it goes without saying, the circuit should be extensively tested on a LAB bench power supply, before connecting it to the actual PACE soldering station. Otherwise, damage to the micro-controller could occur, rendering the soldering station unusable. At this time, the sensitivity of the circuit should be carefully adjusted by connecting the multimeter (in resistance measurement mode) to GND and SWITCH lines and setting the potentiometer, based on the values displayed by the multimeter. It should display O.L. or OPEN when there is no soldering iron placed in the ISB cubby. When soldering iron is present in the ISB cubby (blocking the light from the LED diode to the photoresistor), resistance between the GND and SWITCH lines should be low (in my case around 40 ohms). If any component in the circuit is heating extensively, something is wrong and should be thoroughly investigated before connecting the ISB cubby to the soldering station. After the circuit has been working reliably for a few days, being connected to the PACE soldering station, it is time to consider protecting it from the hostile environment it is operating in; especially from the solder spatter which could cause shorts and potentially damage the circuit along with the micro-controller. The circuit could be encased in a temperature resistant plastic or in my case, covered by protective sheets (with the circular openings for the photoresistor and LED tubing), made from a layer of Kapton tape (non-conductive, temperature resistant) with a layer of ALU foil on top of it. The protective sheets can be removed, if the need to alter the circuit arises in the future. Protective sheets made from a layer of Kapton tape with a layer of ALU tape on top. This shields the circuit from the solder spatter. Electronics repair is not difficult, but it requires a lot of patience, calmness, focus, a steady hand and some common sense. When in doubt or when you do not fully understand something, educate yourself first by checking it online, before following the step in question. If you do not feel competent enough to follow a given procedure, it is best to seek help from an expert technician in your area. I cannot be held responsible for any damage caused to yourself, your equipment or to the device you are repairing as a result of following this tutorial. thanks for sharing this info, indeed very usefull. I would like to say that this has been working for me flawlessly for the past 2 years and a half.